Tata Group in its attempt to mark jewellery making tradition in India spanning 5000 years now coupled with India going crazy over Gold has come up with a unique Nano that’s Gold plated. 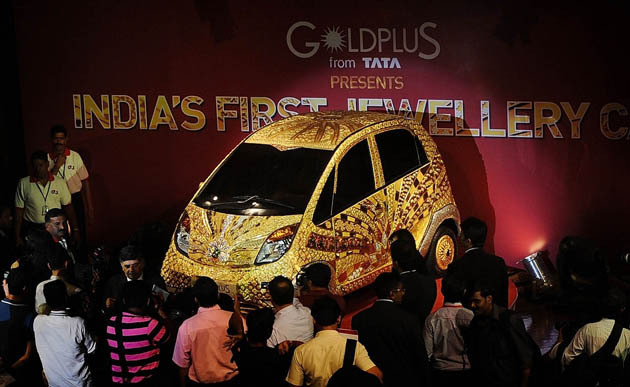 Gold, as we know, is the most desired metal in India, and Tata plans to showcase it on its cheapest car, the Nano. The Nano which costs a paltry 2000 dollars has been transformed into a 4.6-million dollar magnificent artwork. It’s really a mesmerising piece of work for most Indians. GoldPlus is a jewellery brand owned by Titan Industries, which belongs to the Tata Group. Goldplus did reveal the jewellery car that’s Gold plated in Mumbai to mark an era of 5000 years of jewellery making honouring craftsmanship and tradition that still continues to exist in India. It’s now 3 years since the inception of the small car Nano. Chairman, Tata Group, Ratan Tata did unveil the pricey wonder car that has 22 carats of Gold, ruby and jewel encrusts. The Tata Group is known in India for its interests in various fields notably in steel where Tata is now world’s 6th biggest steel manufacturer after acquisition of Corus. In automobile industry, Tata is one of world’s 5 best vehicle makers with recent acquisitions of Land Rover and Jaguar. They still are actively participating in 7 worldwide businesses. Venkataraman, COO, says it was a simple idea. He tells the main idea behind this innovation was to showcase expertise in the art of jewellery making excellence in India, and by deciding to choose Nano as a medium, they couldn’t have thought about a better idea. He says combining Nano with jewellery would be a perfect one that symbolises a common man. 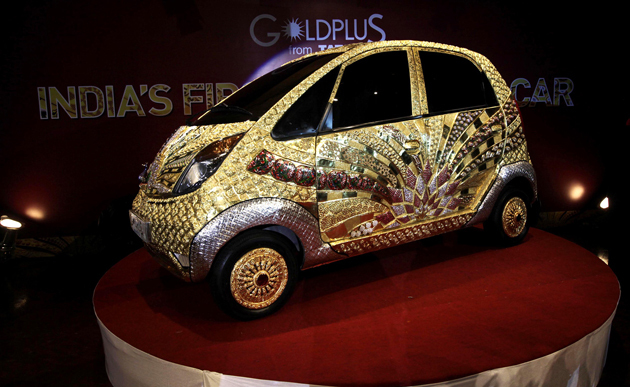 The Gold-plated Nano is called ‘Golden Chariot,’ with 30 artists having participated in its creation employed by GoldPlus in order to bedeck the small car with a total of 80 kg of 22 carats of Gold, 15 Kg Silver along with 10,000 precious gems and stones. MD, Bhaskar Bhat, Titan Industries, says by honouring the 5000 years of jewellery tradition in India, they have also created a Golden car utilising numerous techniques and craftsmanship in its creation. Around fourteen techniques of jewellery making were utilised to showcase the culturally unique and diverse practices incorporated in the world of jewellery all over India. Bhat says jewellery has been an essential part in a woman’s life in India, and it dates back to a very long time where jewellery embedded with precious stones and Gold had evolved and still evolving. He says jewellery in India showcases tradition and culture and various skilful craftsmen had grown in jewellery making with their new designs and innovations. Bhat says GoldPlus offers plenty of crafted jewellery with intricate and traditional designs. As a matter of fact, this isn’t the 1st time GoldPlus had ventured out to show that they are the best in the business. They had created a 6-foot Gold bangle in 2008 that did attract a large number of people to their stores and was also taken on a tour to all the GoldPlus stores in India. Overall, GoldPlus spreads their wings across 5 States in India and have 29 stores. 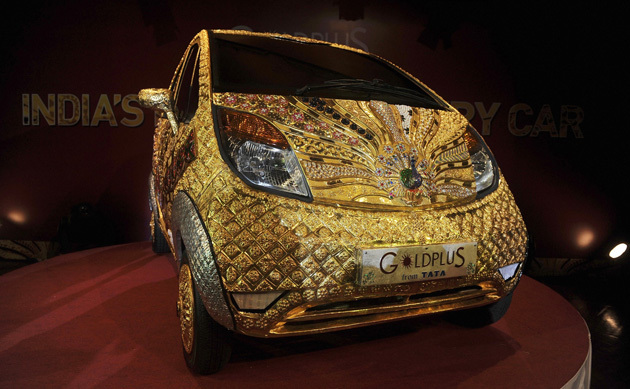 GoldPlus and Tata Group plan to embark on a Gold-plated Nano tour all over GoldPlus stores in the next 6 months. Chairman, Ratan Tata, who acquired Land Rover and Jaguar recently, was the man behind the undertaking of this unique Gold-plated car so we could celebrate India’s strength along with a growth in wealth and portray India’s cultural history. The jewellery-embedded car has precious stones namely pearls, rubies, black beads and emeralds. Unfortunately, the Golden car would not be sold, but would be preserved as a token of craftsmanship.